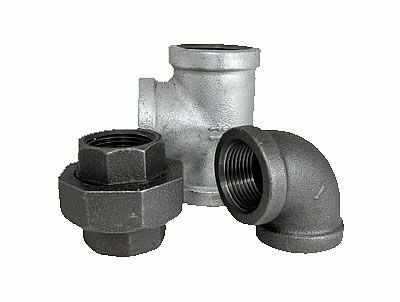 Malleable pipe fittings are manufactured in Blackheart Malleable Iron from the finest materials available and comply in all respects with the requirements of BS143:1986 'Standard specification for Malleable Cast Iron Pipe Fittings'. These pipe fittings have beaded outlets up to 50 mm sizes and banded outlets over 50 mm giving added strength where it is most required and the neatness of form of this beading or banding adds to the appearance of the pipe line. 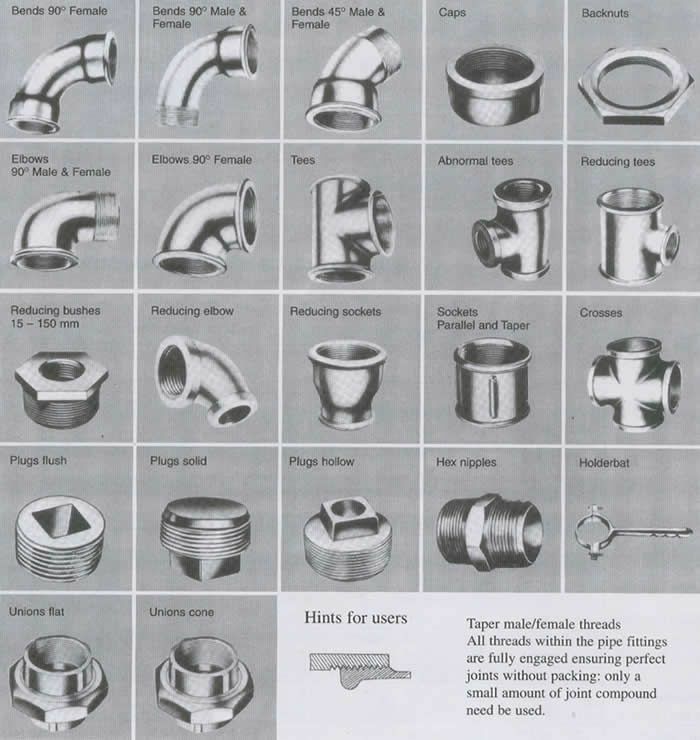 Fittings are screwed with taper male and female threads and this method is now acknowledged as being the best means of producing a satisfactory joint in pipe installations. (It enables the user to make a sound joint without excessive force which can lead to distortion of the pipe or fitting). Pipe fittings are individually pressure tested to 700 kPa air under water. All galvanised fittings are hot dip galvanised according to the best galvanising methods complying with the requirements of BS 729:1971. Malleable pipe fittings are suitable for: Oil, Gas or Steam working pressures up to 1000 kPa. Water working pressures up to 1 400 kPa. All threads comply with BS 21.173/ISO R7 standards.